We will be back in Negril February and wandering if there are any Super Bowl parties/ functions going on in the area. Your site is wonderful and extremely helpful for us. We are now looking for a place to purchase to move to Jamaica permanently. 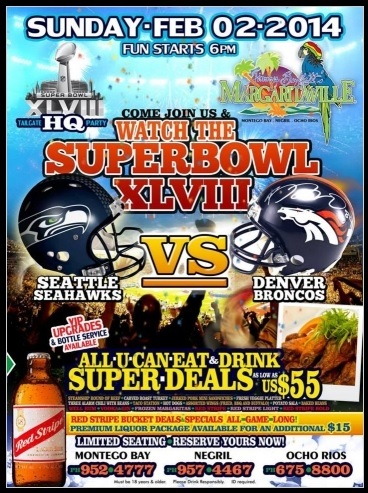 Actually yes, most of the big all inclusive hotels usually has special events on Superbowl. Outside of that though, historically, we typically have Super Bowl parties all across Jamaica - this year is February 5 right? So yes, since you are Negril, you may hop over to Margaritaville Negril. Read more about Margaritivalle here. Regarding moving to Jamaica, click here to read some of the articles we posted on this topic. Be sure to let us know if you need any further assistance.